During the Second World War, Germans had built a series of coastal fortifications along the Western coast of Europe against a possible invasion by Allies. This defensive line which stretched from France to Norway was called Atlantic Wall. Several remnants of these fortifications still dot the beaches. 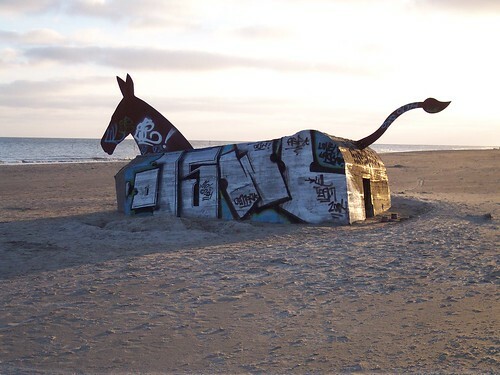 On the occasion of Golden Jubilee celebrations of the liberation of Denmark, four bunkers on the Danish beaches at Lille Strandvej/Skippervej in Blåvand were remodelled and decorated in 1995 by artist Bill Woodrow with steel heads and tails of mule. 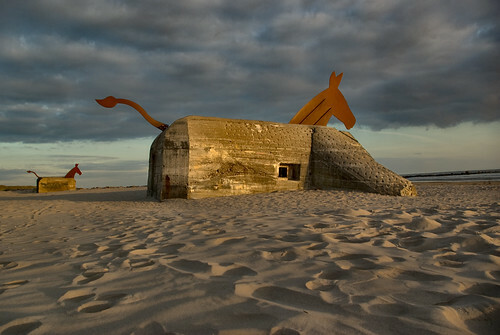 These decorated bunkers appear funny to the viewers and look like Trojan horses left behind by the retreating enemy. 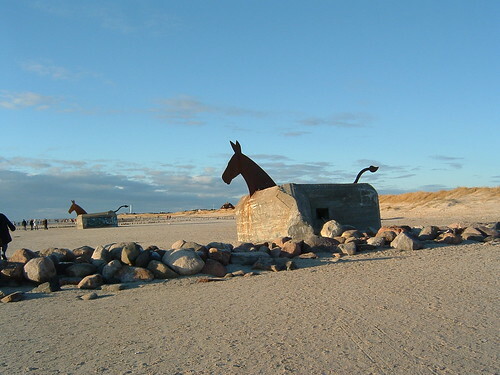 Note: The location marked in Google Earth/Google Maps gives the location of the Trojan horses at the beach at Skippervej. The other horses on the beach at Lille Strandvej are about 300 metres to east of the marked location.